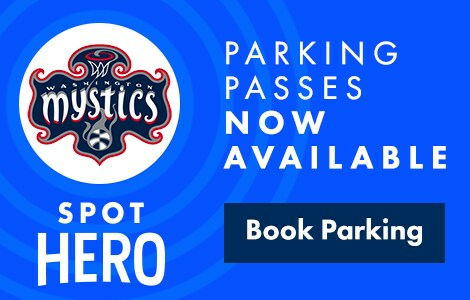 Parking at Washington Mystics games has never been easier! We highly recommend reserving your parking spot in advance with SpotHero, the official parking partner of Captial One Arena, by visiting SpotHero.com or by downloading the free SpotHero iOs or Android App. You’ll secure a convenient spot with rates up to 50% off drive-up when you prepay for a parking pass at one of dozens of locations near Captial One Arena. SpotHero is the #1 parking reservation service, connecting millions of drivers to discounted, convenient parking at more than 2,500 garages, lots, and valets in major U.S. cities, including more than 300 DC parking locations.